BBC Breaking News/TwitterA still from the video, broadcast by the BBC. 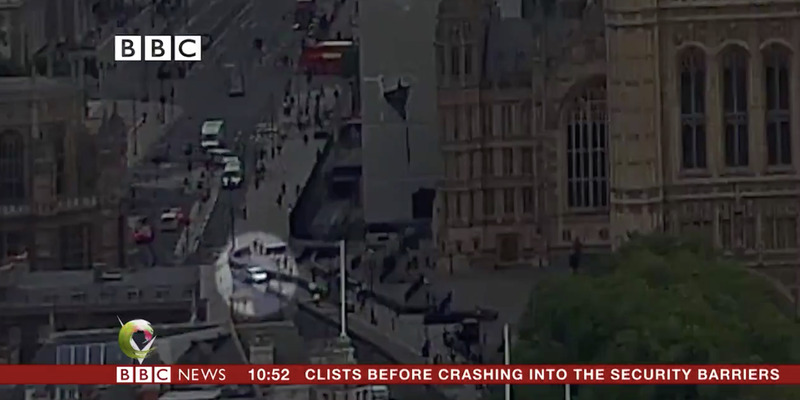 Video shows the moment a car hit several people and crashed into barriers outside the Houses of Parliament in London on Tuesday. The silver Ford Fiesta can be seen driving across two roads before the crash. Video footage shows the exact moment a car crashed outside the British Houses of Parliament in a suspected terror attack on Tuesday morning. The footage, recorded from a rooftop nearby, was published by the BBC on Tuesday morning, a few hours after the attack. 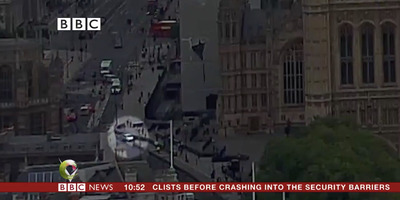 It shows a silver Ford Fiesta driving across two roads and hitting nearby pedestrians and cyclists, before crashing into barriers outside the House of Lords. Police arrested a man in his 20s at the scene, on suspicion of terrorist offences. He had been driving alone. While the suspect has been detained, the car remains on the scene and is being searched. Police say they have not found any weapons. Two people were treated at the scene and were taken to hospital. The London Ambulance Service said the injuries are not believed to be serious.